Canada may be in the midst of a "technical recession," as economists like to call it (we won't know for sure until StatsCan's GDP release in September), but the housing market is showing no signs of it, the Bank of Montreal said in a note Tuesday. The Canada Mortgage and Housing Corp. said the seasonally adjusted pace of new home construction slowed in July, mostly as a result of fewer multi-unit projects started in urban areas. The Ottawa-based government agency says the seasonally adjusted rate last month was 193,032 units nationally, down from 202,338 units in June. That was below an estimate of 195,000 units from economists, according to Thomson Reuters. But the overall numbers point to a healthy housing market that does not seem to be reflecting the existence of a recession, BMO economist Robert Kavcic wrote. The latest housing starts numbers are "consistent with demographic demand, but inconsistent with past national recessions," he wrote. "Indeed, while activity in Alberta and Saskatchewan has been scaled back since oil prices began to slide, the rest of the country has held steady or seen activity increase." 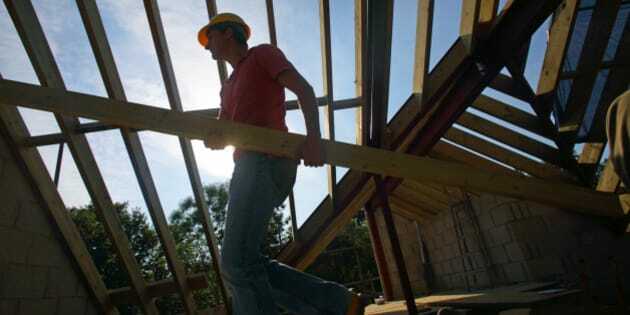 Still, housing starts are down 8.2 per cent from June, CMHC said, with multi-unit housing projects in urban areas accounting for much of the decline. There was also a slight decrease in the detached home segment of urban markets, which fell by 0.8 per cent to 57,520 units. Regionally, British Columbia showed an increase from June but there were declines in the other parts of Canada. But overall, bank economists seemed relieved that the oil price collapse hasn't pulled down the housing market more than it has, at least so far. The CMHC report "highlights how relatively unscathed the trend in housing starts have been from the oil shock, outside of the most affected provinces," CIBC economist Nick Exarhos wrote. But some of the more bearish economists say the trouble for Canada's housing market is yet to come. David Madani of Capital Economics continues to predict "a potentially severe market correction" due to overbuilding. Although housing starts right now are in line with demand, "the number of housing units under construction has risen to unprecedented levels, mainly in the multi-unit market." He expects the number of newly completed, unoccupied housing units to jump by 325,000 "over time." "This oversupply continues to suggest that the economy is vulnerable to a sudden shift in investor sentiment," the economist wrote in a client note Tuesday. Madani had been calling for a correction in the housing market of about 25 per cent for several years. He recently revised his call, and now sees a price drop in the 30-per-cent range in store for Canada's housing market.